There were a lot of amazing moments in 2015. Too many to mention, really. The following are limited to what I consider professional highlights — milestones in my illustration career. There have been so many great people involved, bringing me great work, trusting in me to work with them, inviting me to contribute to their projects. It’s truly an honour, and I cannot be thankful enough. While the following are to me the most significant highlights, they do not even begin to acknowledge all the supporters behind the scenes, be they my steady clients or my always-supportive family and friends. Before I begin, though, I do need to acknowledge my number one supporter, my wife Amanda, and our in house cheerleading team, Nina and Marie. Without their patience, encouragement, and love, I could not have done any of this. So thank you, Froese girls. Now, without further ado, I give you my best 10 from 2015. In 2014, I started illustrating for Stickyscapes New York, a really cool fold-out stickerbook for kids by UK publisher Laurence King. This was the most intensive project to date, with two 5-foot long panoramic illustrations of New York City and some 100 stickers. I released final art in January and had the printed books in my hand (in two languages!) by November. Just as the New York books came in, I was finishing up art for my second Stickyscapes title, Stickyscapes Space. It was an honour to be asked to create not just one, but two titles under this series. Herb Lester creates beautiful illustrated city guides that are reminiscent of tourist maps from the 1950s, 60s and 70s. When they contacted me about doing a guide, my chair hit the ground as I stood up in disbelief/excitement. Coincidentally, they asked me to illustrate a New York themed guide. Having just wrapped on the Stickyscapes title, I was able to hit the ground running and produce a fully illustrated and designed guide within a month. As a lover of vintage maps and New York, this remains my favourite piece to date. Having researched New York City extensively for the above projects, it was a no brainer to attend Brand New Conference 2015, which was this year hosted in the city. For a number of years, especially as an art director, I had dreamed of going to the event, which caters to designers. As an illustrator, it actually made a lot of sense to go, since it is art directors and designers who now commission me after all. I met some of my favourite Internet buddies and got to rub shoulders with some of the most legendary people in the industry. One of the best things to come out of this trip: meeting Ben Levitz of Studio on Fire, who in turn invited me to illustrate for their 2016 Calendar. Early in the year, my family decided it was time to leave Vancouver for greener and more spacious pastures. Literally. We sold our condo and moved to a split level in the semi-rural village of Yarrow, BC, an hour outside the city. Along with this decision came the rather painful-at-first transplantation of my studio from the bustling Railtown district of Vancouver to a quiet farm-based studio shared with local potters. It was really lonesome at first and had me questioning the whole move, given the need for creative community as an illustrator. But after a month, I was settled in and there was no turning back. Best thing about the move: the commute. While my work primarily consists of editorial and the odd retail project, I do get a few jobs outside the usual from time to time. This year, in the “odd job” category, my commission from New York steak restaurant Quality Eats took the cake. Restaurant interior architecture and design team Reunion Goods & Services had me illustrate a series of large framed canvases that integrated with their electrical lighting system. You need to see the pictures to see what I mean! With art direction that included “draw a prostitute and a cow on a skateboard”, this was definitely one of the most hilarious and amazing jobs I’ve ever had. One of my long game goals is to regularly share my expertise and experience with others. Public speaking, writing and teaching are among the activities I hope to do more of as I mature and grow in my art. It was with gratitude and a knotty tummy that I accepted the invitation from Adobe to speak at Vancouver Creative Jam. It was convenient that I had just done all those projects about New York, so I just talked about my illustration process by walking the audience through a couple of those projects. It was so good to be able to share to a listening audience (they were amazing), and to answer such good questions. I basked in the glow of a successful presentation (no need for knots in the old tum-tum after all) as I sipped beers with new friends and fellow presenters after the show. Turns out I quite like public speaking. For the past two years, my pal Vince at Eveverlovin’ Press and I have created letterpress projects that aim to elevate the art of letterpress printing in Canada. 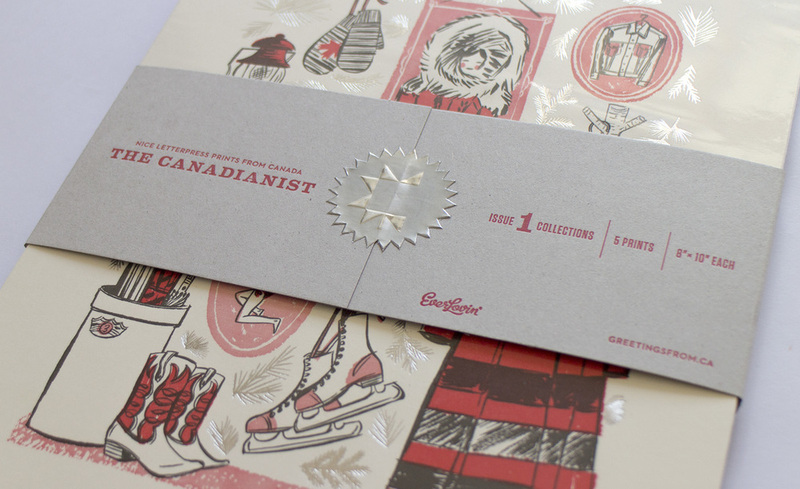 Last year, we created Greetings From Canada, a 10 artist collaboration of 10 Canadian-themed post cards. It was a hoot and a success. This year, we went with a similar theme, but with a smaller batch of artists and a larger format to create The Canadianist — 5 8” x 10” prints. We were elated to have names like Katy Dockrill, Andrew Kolb, Jeannie Phan, and Ben Weeks in the mix. Of course, with a foil stamp as part of the design, I couldn’t resist inserting myself into the mix. Another first this year is being in a group show. Bloodbath was shown at 71a Gallery in London (UK), and was organized by Edward Tuckwell and Josh Mckenna, fellow artists on the MP-Arts agency roster. Skillshare had been asking me to develop a class for a while. They asked me first in the summer when things we just nuts for me. I figured it wasn’t a big deal, they probably ask everyone to teach. But when they asked me again in October, I was persuaded. I took on the project fully aware that building a good class and then shooting/editing my own video footage would be a crapload of work. And it was (had a lot of help on the editing side). Creating this class dominated an already saturated work month, but in the end (and after a lot of support from the folks at Skillshare and one very patient video editor), we pulled it off, and Inky Illustrations was born. I was pleased when, after only 2 weeks, the class had amassed over 1,000 students and ridiculously generous reviews. Sticking it through for this class taught me the value of shunning self doubt; it reinforced the importance of encouraging collaborators; and it reinstated my love for teaching. All in all, a big win. While I haven’t heard much about what people thought about my writing for the Hunger issue of Applied Arts Magazine, being published as a writer is another significant milestone for my career. The article was featured in their craft column, where, each issue, they feature an essay by an industry professional “to open up peer-to-peer dialogue”. Had I supplied them with a better headshot for the piece, I would have liked to show you a pic of the spread! Looks like you'll have to order the mag to read it! So those are my 2015 highlights in a nutshell. I want to include so many more things above, like the front of book series of illustrations for Monocle Issue 83, the crazy illustrations I did with the folks at Will Inc., all the great projects (like Wired UK and The Harvard Business Review) from Tim and Karlie at MP-Arts, and of course, being added to the Mendola Artists roster of illustrators more recently. If 2015 is an indicator of how things will go in 2016, I’m very, very excited. Thank you for following along. I can't wait to see what's next.